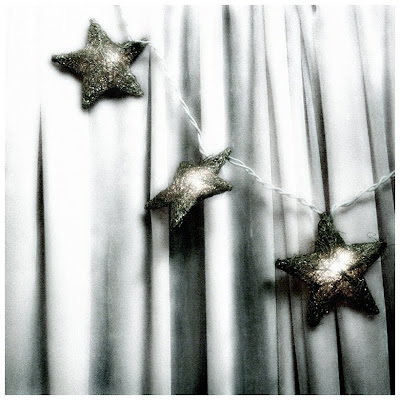 Softness and stars to start my Saturday. It is one of those days where I read other blogs and become insecure in all that I do, and I am not begging for assurances that I am okay, I know I am, but these differences that I love are sometimes pinpricks in my soul, and I think I am too wordy, too this, too that, my photos not soft enough, my outlook too serious, and I wonder why I just don't go out there right now and take pictures of the leaves laying in the grass, why I am incapable of making that beautiful, and I think I should make that a project, but that sounds too much like school, and there is a should in that phrase, and shoulds always get me into trouble. It is a sunshiny cool Saturday morning out there and there is the vet to be visited, poor Maggie asleep beside me will growl when she realizes, and there is the gallery reception this afternoon with nibblies to nibble, and there is a door to be repaired, a lovely green door, and I have hopefully hired someone to prepare my canvases for me, which is easy but time consuming and keeps me from painting because I never paint directly on the canvas, I have all this stuff I do to it before painting. My fingers are crossed for this person to say yes. But to me you are doing it all right - the photos, the words, the art - a true artist sharing with genuine humility. and i love coming here. Oh I know that insecurity all too well. But sometimes, what might have evoked insecurity actually turns into inspiration...depending on the day. Especially when I visit you. Don't we all feel this way sometimes? I know I do...but so many of these incredible blogs (like yours) keep me inspired and shooting higher than I ever thought I could. So don't compare yourself to anyone... As Beth says at her blog: "Be yourself, everyone else is taken." I love your writing here; thanks for taking me somewhere else! No frettin'! Life is too short! Did they? Tell me they said yes.